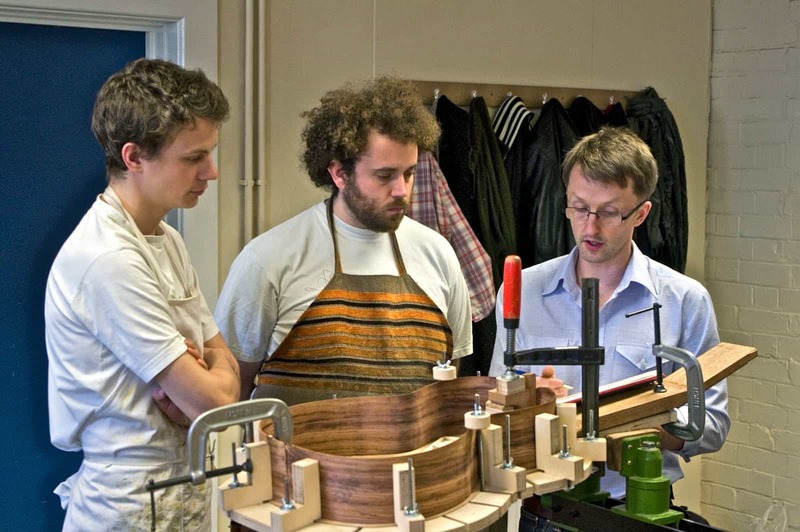 Last week I spent a day as a visiting lecturer at Newark College where Adrian and Mal run a guitar making course. 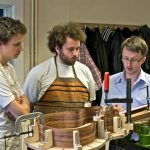 It’s a two year course where the students learn about making acoustic guitars by hand. I came and and gave the students a talk in the morning, we covered guitar design. 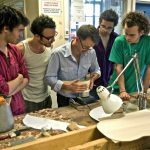 Every year the students have a “guitar race” – they work in small teams and build a guitar in 24 hours flat. A great idea! So it seemed a good idea to talk about how I came up with the Model S design. One thing I noticed about the previous “guitar race” guitars was that they were very traditional guitars and non of the students in the past had given much consideration to simplifying the design. I love the notion of stripping a design down to the bare essentials, so who knows, maybe this years race will have a few new ideas and when faced with a limited time to build, may concentrate on that which really matters. Then I talked to the students about the whole business side of things – dealing with people, prices, advertising – all the things that non of us want to think about! But these are things which can’t be ignored if we hope to make our living as luthiers. I hope some of me words struck a chord. After lunch my time was spent working with the students on their projects, it was really interesting to dive in, some of the students are very good and it was fun to introduce them to some of my design ideas which really were new to them. Quite a few of them bough me book which was nice too. Towards the end of the day I bent a pair of sides for one of the chaps who was about to start on a maple guitar. The sides looked like they may be trouble – with run out and a flaw or two, but they went well and my reputation remained intact!! Yes, it was a really nice day, Adrian (AJ Lucas) and Mal do a fine job. Long may it all last!